Slices of pretty sandwiches are great for a get together. Its a perfect tea time snack also. There are many different ideas for fillings and spreads according to our taste. 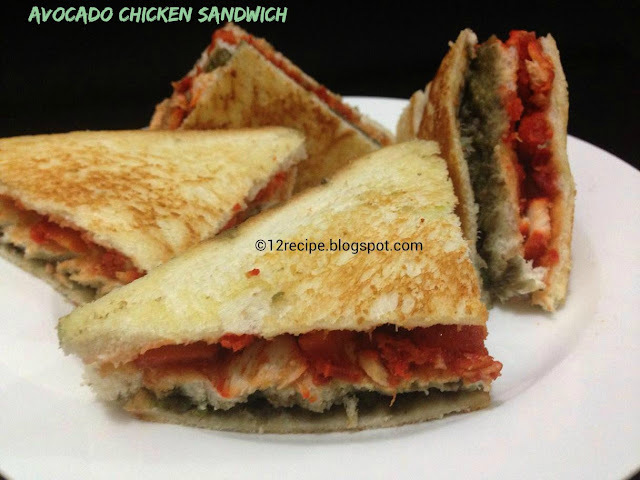 Avocado chicken sandwich packs lots of flavors and taste in it. It is simple easy to prepare and a nice combination. Use any pieces of fried or steamed chicken for making this. Mash avocado well with a masher or blender; Mix it with mayonnaise, pepper powder, lemon juice and salt.Keep aside. Take a slice of bread and apply 1 tbsp of tomato ketchup in it. above that spread 1/4 cup of minced chicken tightly. Cover it with another piece of bread by applying a tbsp of tomato ketchup to stick. On the other side of that bread slice; spread half of the avocado mix. Lastly cover it with a piece of bread. In this way; prepare the another two slices of bread. Heat a pan with butter and toast both sides of sandwiches until golden. Cut the sandwiches in to diagonal pieces and serve warm.